"We are on the cusp of a new revolution in Neurological Surgery." The concept of Minimally Invasive Neurosurgery introduces highly refined techniques and approaches, to the Neurosurgical treatment of Brain and Spinal diseases. Major advances in Neurological Surgery have occurred over the past 30 years consequent to the development of Microneurosurgical Instrumentation and procedures, the improvement and reliability of diagnostic neuroimaging methods (MRI and CT scanning), and the availability of sophisticated anaesthetic techniques. Currently we are enjoying the "next step" in the evolution of Neurosurgical capabilities with the introduction of Minimally Invasive Neurosurgery techniques. While the operations still require the "opening" of the Skull (for Brain operations) or the Spinal Canal (for Spine operations), these openings for exposure are much smaller than ever previously contemplated. LIMITED EXPOSURE means limited "injury" to surrounding tissue. This usually results in the REDUCTION of POST-OPERATIVE PAIN, REDUCTION in the LENGTH of STAY in the HOSPITAL (many operations are done on an out-patient basis), REDUCTION in TIME to RETURN to WORK and REDUCTION in OVERALL COST. Minimally Invasive INTRACRANIAL Neurosurgery involves the use of an instrument system which uses an ENDOSCOPE. This is an instrument that permits "visualization" of anatomical structures within the body using a narrow channel that incorporates a brilliant light source together with a sophisticated, miniaturized camera system. The ENDOSCOPE also has "working" channels through which small, elongated instruments can be placed in order to conduct operations deep within the body. There are three(3) types of ENDOSCOPIC operations available for Neurosurgical procedures inside the Skull (Brain surgery), as well as inside the Spinal Column. ENDOSCOPIC SURGERY: This is an operation conducted entirely through the Endoscope. All the instruments that are used in the operation are introduced through the small, working channels that are incorporated within the Endoscope. Examples of this type of surgery includes: Anterior Third Ventriculostomy (for Hydrocephalus), Intraventricular operations for removal of Tumors such as Intraventricular Meningioma or a Colloid Cyst and Fenestration/Resection of Intracranial Arachnoid Cysts (See Figures 1 & 2), among other procedures. 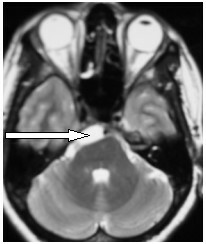 Figure 1A (Left): MRI Scan (Coronal View) of large Arachnoid Cyst (Arrow) in a 13 year old male. 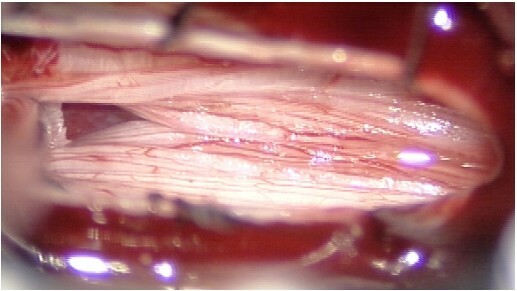 Figure 2: Minimally Invasive Endoscopic Resection of an Arachnoid Cyst (same patient as Figure 1). The Assistant Surgeon, Dr. 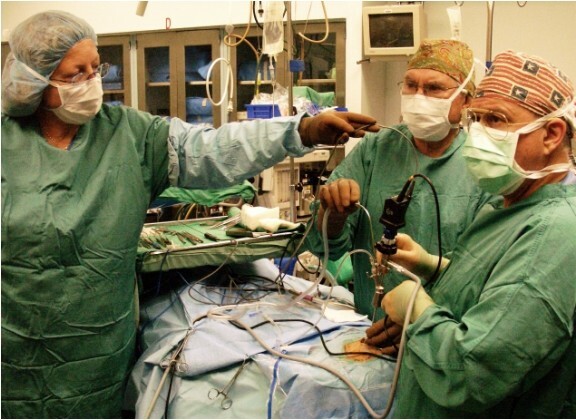 Bland, is holding the ENDOSCOPE with his left hand (brown glove that is resting against the patient's skull) while the Surgeon, Dr. Lazar (right), manipulates elongated micro-instruments THROUGH the ENDOSCOPE. The Senior Neurosurgical Nurse, Ms. Christine Thomson, is holding the "micro-bipolar electrocautery" wire that Dr. Lazar is using in his right hand. The team watches a "television" monitor to which the ENDOSCOPE'S camera image is transmitted. ENDOSCOPIC ASSISTED SURGERY: This is an operation conducted using a sophisticated Neurosurgical Operating Microscope for visualization and advanced Microneurosurgical techniques, to surgically manage a disease process. During the operation an Endoscope is introduced into the operative area to permit visualization of structures beyond the range of the operating microscope, such as around corners or "underneath" other deep anatomical structures. The Endoscopic image can be viewed on a television monitor, or through a "heads up" display projected to the operating microscope. Examples of this type of Neurosurgical operations include Aneurysm and Skull Base and Brain Tumor surgery. Figure 4: MRI Scan (Sagittal View-same patient as Figures 3 & 5) of Posterior Cranial Fossa Skull Base Tumor. The Pons is indented and displaced Posteriorly (Arrow) by the tumor. Figure 5A (Left): Operative Photo of a Right Retromastoid (behind the Right ear) "Keyhole" Craniotomy (same Patient as Figure 4). This Skull Base Tumor (Arrow) extends Anterior to the 5th, 7th & 8th Cranial Nerves and around the front of the Brain Stem. Figure 5B (Right): Operative Photo after the ENDOSCOPIC ASSISTED resection of the tumor. 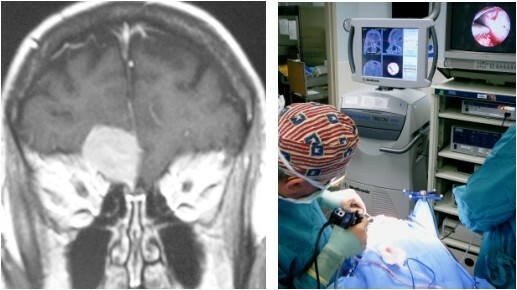 Figure 6B (Right): Operative Photo of The Endoscopic (Assisted) Image Guided Resection of this tumor through a "Keyhole" Craniotomy through an EYEBROW incision (Glabellar Approach). ENDOSCOPIC DIRECTED SURGERY: This is an operation that is conducted with the Endoscope as the primary visualization system rather than the Operating Microscope. In these operations, the Endoscope's image is viewed on a television screen with surgical tools being used "OUTSIDE" (that is, beside and around) the Endoscope rather than introducing the instruments through the Endoscope's narrow internal channels. 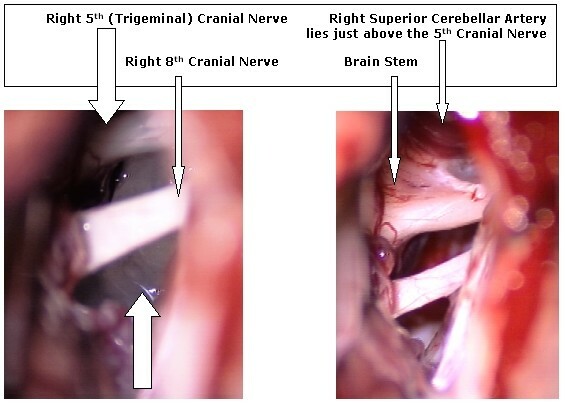 Examples of these Minimally Invasive Microendoscopic INTRACRANIAL Operations include Transsphenoidal Resection of Pituitary Tumors (See Figures 7, 8 & 9), Skull Base Tumor removal (See Figures (6A & 6B), Microvascular Decompression (MVD) of Cranial Nerves for Trigeminal Neuralgia, Intraventricular Tumors, and Aneurysms. 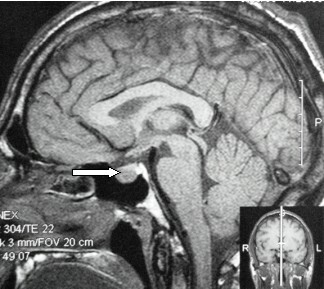 Figure 7: MRI Scan (Sagittal View) Pituitary Tumor (Arrow) in an Acromegalic male. The tumor was successfully removed using a Transsphenoidal Minimally Invasive Microendoscopic DIRECTED Technique. 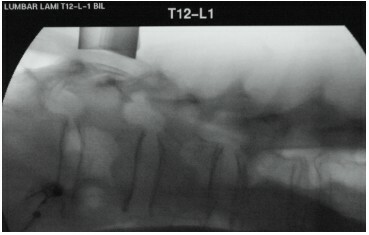 Figure 8: Intraoperative Fluoroscopic X-ray Image (Lateral View) for real time guidance of the resection of the Pituitary Tumor. The instruments, including the Endoscope (Arrow) are visible on this x-ray image. (Compare to the Surgeon�s activity in Figure 9). The introduction of Minimally Invasive Neurosurgery constitutes a real revolution in the treatment of spine problems. These techniques have become the method of choice for most of our procedures. The concept of Minimally Invasive Surgery has been used across many areas of surgical disciplines. In the area of Spine Surgery, we believe that this SHOULD MEAN using the smallest aperture retraction systems possible. It is now generally accepted that Posterior (from the back) approaches to the Spine can and should be done in a way that preserves the function of the large muscles that course vertically along either side of the Spinal Column (See Figures 10 A & B below). The older technique (including standard microsurgical procedures) of midline incisions require that these paravertebral muscles be stripped from the spinal bone and held retracted under considerable pressure to allow the surgeon access to the Spinal Canal. Figure 10A (Left): Diagram of a CONVENTIONAL MICROSURGICAL RETRACTOR which requires stripping muscle from the bone and holding them under pressure behind the retractor blade. Figure 10B (Right): Diagram of a MINIMALLY INVASIVE TUBULAR RETRACTOR which is separating muscle fibres rather than stripping them from the bone. The technology for Minimally Invasive Spine Surgery allows for an incision just off the midline to the side of the pathological process (such as a Herniated Intervertebral Disc and/or Spinal Stenosis [narrowing of the Spinal Canal]). Instead of stripping muscle from bone, the muscle fibres are separated and held retracted by narrow diameter tubes. In point of fact, the diameter of these tubes varies in size from 14 millimeters to over 26 millimeters (one inch). With larger bore retractor tubes more muscle is displaced and potentially injured. We believe that the SMALLEST DIAMETER TUBES SHOULD BE USED. For most routine Lumbar and Posterior Cervical Spine Surgery, we utilize 14, 16 and 18 millimeter diameter tubes. 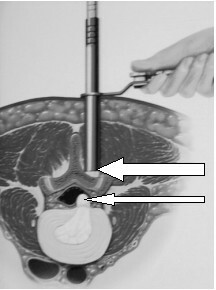 Figure 11: Diagram of Minimally Invasive Tube Retractor being placed in position over a portion of the Lamina and Facet Joint of a Lumbar vertebra (Upper Arrow). The "Herniated" Lumbar Disc (Lower Arrow) lies underneath the Bone which must be opened in order to gain access to the Spinal Canal. Minimally Invasive Microendoscopic Spine Operations are being conducted for Spinal Cord Tumors, Herniated Intervertebral Disc, Spinal Stenosis, Lateral Recess and/or Foraminal Stenosis, Cauda Equina Claudication and Spondylolisthesis. 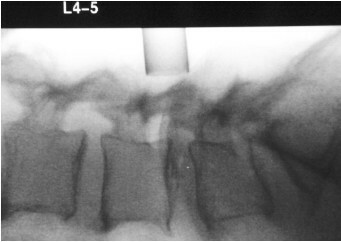 These Minimally Invasive Techniques allow for operations such as Laminotomy, Laminectomy, Transforaminal Lumbar Interbody Fusion (TLIF) and Placement of Pedicle Screw & Rods for Spinal Instability requiring a Fusion Operation. (See Figures 16, 17 & 18 Below) All of these procedures are reviewed on this website. 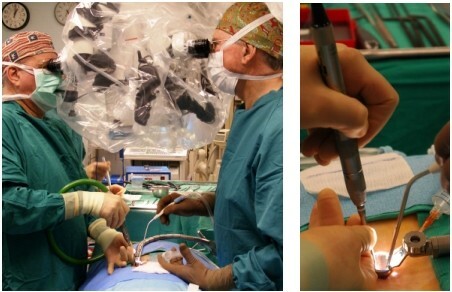 Figure 12A (Left): Operative Photo of Neurosurgeons performing a Minimally Invasive Microsurgical Lumbar Spine Laminotomy. They are using a LEICA Neurosurgical Operating Microscope. Figure 12B (Right): Operative Photo, "close-up" view of the Minimally Invasive (Medtronic-Sofamor-Danek, Inc.) tube retractor. An exciting and revolutionary development in Spine Surgery is the incorporation of advanced techniques within the principles of Minimally Invasive Spine Surgery. For spinal conditions that require both sides (BILATERAL) of the Spinal Canal to be decompressed, we routinely use a UNILATERAL (one-sided) APPROACH. The advantage here is that the spinal muscles are disturbed to a minimal degree and only from one side. The results are a dramatic change from previous operative techniques. This has considerable importance for patients who have severe Spinal Stenosis resulting from Lumbar Facet and Ligamentum Flavum hypertrophy as well as patients suffering from Spinal Cord Tumors. 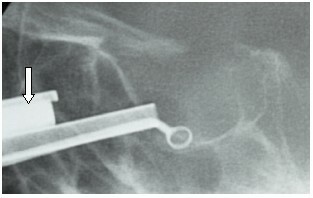 Figure 15: Intra-operative Fluoroscopic X-ray image (same patient) shows the precise positioning of the MINIMALLY INVASIVE TUBE RETRACTOR. This patient underwent a BILATERAL L4 & L5 Laminectomy with Bilateral L4 & L5 Foramenotomies using a Unilateral Approach. He was discharged home several hours following the procedure and was then able to walk without pain. The result of this technical surgical advance is that our patients (including many of those over 70 years of age) who undergo Minimally Invasive Bilateral Decompressive Laminectomies using a Unilateral Approach are usually out of bed within 4 hours of operation. Most operations conducted for HERNIATED INTERVERTEBBRAL DISC and/or SPINAL/FORAMENAL STENOSIS (including those requiring Bilateral Decompressive Laminectomy using a Unilateral Approach), are considered to be more routine procedures which can be accomplished through 14, 16 or 18 millimeter diameter tubes. These are the smallest tubes available and cause the least disruption of tissue. For most of our patients this permits them to be treated on an OUT PATIENT, DAY-SURGERY BASIS. The results of this means: less pain, less requirement for powerful pain-relief medications, early discharge from hospital, less complications and earlier return to work activities. This, too, reduces overall health care cost. (Please consult www.aans.org/education/journal/neurosurgical/aug02/13-2-5.pdf for additional information). Minimally Invasive Lumbar Spine Fusion operations are now routinely used for these procedures. Our indications for fusion are quite strict and generally are reserved for patients who are symptomatic with demonstrated spinal instability (such as Spondylolisthesis. Although all of these patients are also walking within 4 hours of surgery and most want to go home the same day, we generally prefer that they stay in hospital overnight. 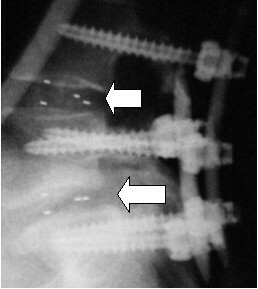 This, as well, is a major advance compared to more conventional techniques of "lumbar fusion". 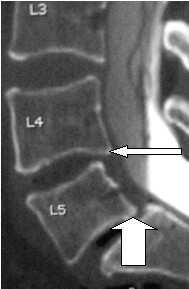 Figure 16: Post-myelographic CT Scan demonstrates SPONDYLOLISTHESIS (Anterior slippage of the L5 Vertebra upon the S1 Vertebra - Lower Arrow). This operation consists of several different steps all of which are conducted using Minimally Invasive techniques. In this case Facetectomies (Unilateral Approach) and Transforaminal Interbody Fusions (TLIF) with Pedicle Screws & Rod Fixation were completed at the L4,5 and L5,S1 levels. Figure 18: Photo of Minimally Invasive Incisions used for the extensive procedure illustrated in Figure 16. Spinal Cord Tumors are difficult and dangerous problems. With the introduction of Minimally Invasive Spine Surgery techniques we are able to offer improvements in the management of these conditions compared to standard operations for the removal of Spinal Cord Tumors such as Spinal Meningioma, Ependymoma and Neurofibroma. For spinal cord tumors a larger diameter tube (called an "X-Tube" - http://www.medtronicsofamordanek.com/physician-minimal-metrx-xtube.html) is required although the opening is far smaller than operations conducted in the more conventional laminectomy fashion. 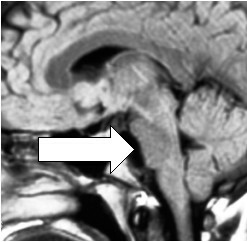 Figure 19: MRI Scan (Sagittal View) T12, L1 level Intradural Spinal Cord Tumor (Neurofibroma). This tumor is an integral part of the SINGLE NERVE ROOT which can be seen entering the Tumor from above and leaving it at its lower end. COMPARE THIS TO FIGURES 21 & 22 below. FIGURE 21: Minimally Invasive Resection of the Intradural Neurofibroma. The Tumor (Large Arrow) arises from a SINGLE SENSORY Nerve Root (Small Arrows) which must be cut in order to remove the Tumor. This rarely results in any significant neurological deficit since there is considerable sensory overlap from adjacent segments. Figure 22: Operative Photo after Minimally Invasive Resection of the Intradural Spinal Cord Tumor (Neurofibroma - Same Patient as Figures 19, 20 & 21) . The pressure that had been exerted on the Spinal Nerve Roots has been successfully relieved. Cervical Spine operations constitute a significant part of our practice. For those patients with conditions that are amenable to a Minimally Invasive approach (such as has been described above), we are pleased to offer this alternative. 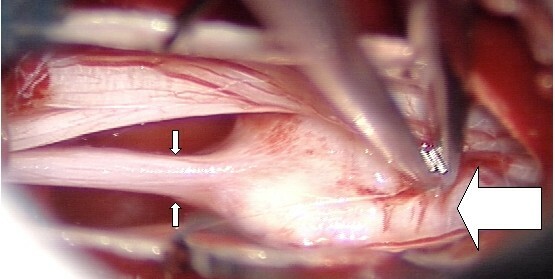 The conditions that do lend themselves to this technique include Far Lateral Extruded Cervical Intervertebral Discs, Foramenal Stenosis secondary to Cervical Facet Hypertrophy, Spinal Stenosis secondary to Hypertrophic Ligamentum Flavum as well as some Spinal Cord Tumors. Figure 23A (Left): Post-myelographic CT Scan of C3 in a 34 year old Female demonstrates a markedly hypertrophic (overgrown) Left Facet (Arrows).